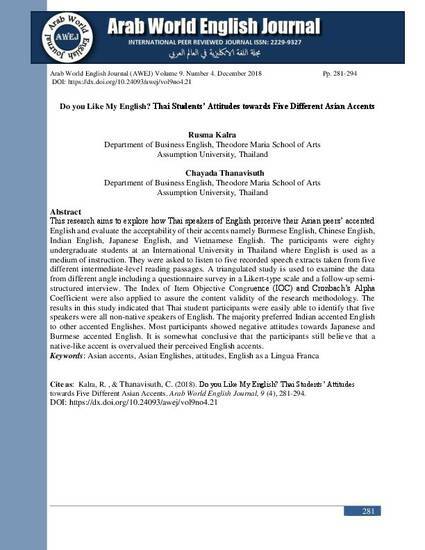 This research aims to explore how Thai speakers of English perceive their Asian peers’ accented English and evaluate the acceptability of their accents namely Burmese English, Chinese English, Indian English, Japanese English, and Vietnamese English. The participants were eighty undergraduate students at an International University in Thailand where English is used as a medium of instruction. They were asked to listen to five recorded speech extracts taken from five different intermediate-level reading passages. A triangulated study is used to examine the data from different angle including a questionnaire survey in a Likert-type scale and a follow-up semi-structured interview.  The Index of Item Objective Congruence (IOC) and Cronbach’s Alpha Coefficient were also applied to assure the content validity of the research methodology. The results in this study indicated that Thai student participants were easily able to identify that five speakers were all non-native speakers of English. The majority preferred Indian accented English to other accented Englishes. Most participants showed negative attitudes towards Japanese and Burmese accented English. It is somewhat conclusive that the participants still believe that a native-like accent is overvalued their perceived English accents.